Using object-recognition technology that leverages augmented reality, Seek & Speak turns everyday objects into conversation practice with scavenger hunt-style challenges. 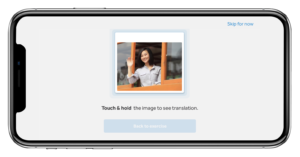 Seek & Speak enables users to point their iPhone’s camera at an object and receive a translation in the language they’re learning, and then practice conversation using the newly obtained vocabulary with TruAccent®—Rosetta Stone’s proprietary speech recognition engine. 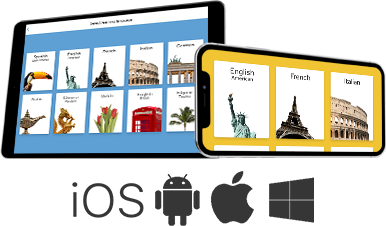 The Beta version is currently available in core lessons of English, French, Spanish (Latin America), Italian, and German. We’ll continue to add the feature to more languages throughout 2019. In response to user feedback, we’ve launched embedded translations. At any point in the immersive experience, customers seeking clarity on vocabulary in the immersive experience can “long-press” on a word to reveal its translation. 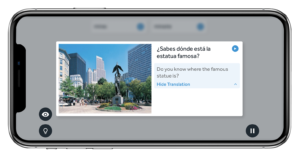 Embedded translations are now available in core lessons of English, French, Spanish (Latin America), Italian, and German, and will expand to more languages throughout 2019. See it in action here. When you open Phrasebook in your mobile app, you’ll find 160+ useful phrases organized by categories such as getting around or being polite. Travelers will be happy to hear Phrasebook is available offline, so no need to trigger roaming chargers or lug around a bilingual dictionary. The feature is currently available in core lessons of English, French, Spanish (Latin America), Italian, and German. Get the accent right with instant pronunciation feedback from the latest edition of our patented speech engine, TruAccent. While other language learning apps use simple pattern recognition, TruAccent taps machine learning and thousands of hours of recorded speech data to make sure your learning experience is first-class. It’s currently available in all 30 languages offered by Rosetta Stone. Going 100 percent digital has made us more nimble than ever, whether it’s responding to needs from our community or creating all-new experiences that bring learning to life. We’ll continue rolling out new features across languages and platforms, so be sure to keep your Updates in the App store on.